38 ladies came together at Kingsthorpe GC for our annual match, however I would mention the 2 years previously had been cancelled on the day due to flooded courses, so relief all round. It could only be described as perishing with a biting northerly wind with the sun also staying away, but it was an amusing sight as 2 Bedfordshire ladies appeared in shorts but arrived at the end with woolly hats on. 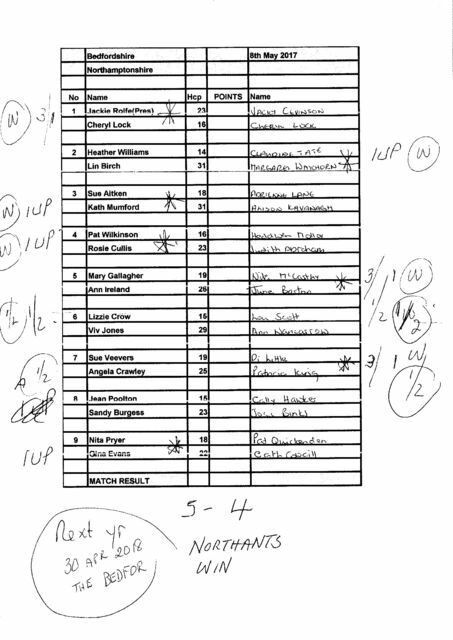 Matches however really hotted up with 6 of the 9 matches going to the 18th green, one of the closest encounters we have had with Northants prevailing 5-4. Nita Pryer our match secretary must have had divine help when booking our meal, roast beef followed by hot apple pie on this very cold day was wonderful. 30th of April 2018 at The Bedford has been booked for our return match.